tell you what we will do with your information and who it will be shared with in the form of a Privacy Notice (as below). Although sometimes the law requires that we share your information with other agencies to help reduce crime or investigate fraud. By 'personal information' we mean data that is unique to you, such as a name, address, telephone number and even online identifiers (IP address). We will comply with the processing principles of the Data Protection legislation when handling your personal information. Please note that not all of the above will apply to AF&RS. Have used our fire and emergency service. Have used our safety services either within business, community/home safety or youth services. Please note that further information about Data Protection (including an individual’s information rights) at Avon Fire & Rescue Service is available on our Data Protection section. We collect, process and hold personal information about you in order to provide public services associated with that of a Fire & Rescue Service and as an employer. This notice explains how we use and share your information. Information about you may be collected on paper, online, by telephone, email, by a member of our staff, or one of our partners, or images captured on CCTV. We will continually review and update this Privacy Notice to reflect changes in our services and feedback from service users, as well as to comply with changes in the law. When such changes occur, we will revise the ‘last updated’ date above. manage the employment relationship and comply with Employment Law. AF&RS are committed to protecting and supporting vulnerable people including children, young people and adults at risk of being abused or neglected. Our personnel frequently work with families and their children, in their homes, schools and communities and have a duty of care to take action to prevent the suffering of a child or vulnerable adult. Government guidance makes it clear that safeguarding is a shared responsibility, and depends upon effective joint working between agencies and professionals that have different roles and expertise. AF&RS therefore work with other agencies to ensure that we escalate any safeguarding concerns and where appropriate, AF&RS will always seek the individual’s cooperation to participate in the safeguarding intervention. The lawful basis that we may collect, share and process personal data for safeguarding concerns is when it is ‘necessary for the performance of a task carried out in the public interest’ (as per GDPR 6 (1) (e)) as we have incidental powers under the Fire & Rescue Services Act, in that ‘we may take any action we consider appropriate in response to an event or situation that causes or is likely to cause one or more individuals to die, be injured or become ill (Part 11 (2) (a) FRS Act 2004’. The lawful processing basis for special category data (sensitive personal data, such as health data) would be when processing is necessary for reasons of substantial public interest (GPRP 9(2)(g)), which is supported by conditions within the DPA 2018 - Schedule 1, Part 2: 18 Safeguarding of children and of individuals at risk as also set out in our AF&RS Data Protection Policy. Our aim is not to be intrusive, and we won’t ask irrelevant or unnecessary questions. The information you provide will be subject to rigorous physical, electronic and administrative security measures to make sure it can’t be seen, accessed or disclosed to anyone who shouldn’t see it and to protect against unlawful processing, accidental loss, destruction and damage both on line and off line. We have a collection of policies and procedures, including Data Protection and Information Security policies which define our commitment and responsibilities to your privacy. We provide training to staff that handle personal information and treat it as a disciplinary matter if they misuse or do not look after your personal information properly. The information you provide to us will be held on a server in the United Kingdom and may be accessed by our staff, third parties (including our business partners), government bodies, law enforcement agencies and suppliers we engage to process data on our behalf or who act for us for the purpose set out in this statement. Where possible, we will seek to comply with your request but we may be required to hold or process information to comply with law or one of our statutory duties. To make a request for your own or your child’s personal information, or find out if you can act upon the rights listed above, you can contact the Data Protection Officer (contact details below) or visit the AF&RS webpages listed in the ‘Further Information’ section below or refer to the Individual Rights page of the website. 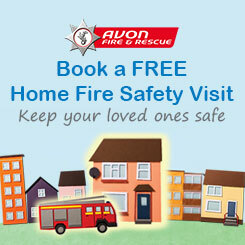 Avon Fire & Rescue Service do not capture or store any personal information about individuals who access our website, except where you voluntarily choose to give us your personal details via email, use an electronic form or enquire about any of our services. In these cases, the personal information that you give us will be used exclusively for providing you with the information you have requested in accordance with the GDPR and the Data Protection Act 2018. By registering for any service on the website or by providing your information to us, you consent to the collection, use and transfer of your information under the terms of this statement. We collect information automatically about your visit to the website for monitoring the use of our site and to improve its content. This does not include personal information. We will not sell, share or rent any part of the information collected on the website (or if acquired by other means) to third parties, unless stated on the web page at the point of collecting information from you, or is required by law. Given that the internet is a global environment, using the internet to collect and process personal information necessarily involves the transmission of data on an international basis. Therefore, by browsing our website and communicating electronically with us, you acknowledge and agree to our processing of personal information this way. Essential cookies are there to ensure that the AF&RS website operates as it should. Session cookies are only stored for the duration of your visit to the website and allow certain functions to work correctly. These cookies are used to collect information about how our visitors use the AF&RS website. The information is used to monitor usage and identify areas where the website can be improved. The cookies provide us with information such as what time a visit occurred, if the visitor has viewed the website before, and how the visitor found the website. To opt out of Google Analytics. Law Enforcement and crime agencies. Information provided to Law Enforcement and crime agencies relating to prevention and detection of crime. Information which is necessary to prevent serious risk to individuals (safeguarding). Provision of data to organisations that process data on our behalf, for example, our payroll provider. Staff payroll data, which is provided to external bodies responsible for auditing and administering public funds. This is for preventing and detecting fraud. Any information processing, including when there is a genuine requirement to share your personal data, we will ensure that such processing is done lawfully, taking into account your rights and expectations, that any data sharing is done securely and in line with Service policies and Data Protection legislation. We will retain your information for a reasonable period or as long as the law requires in accordance with our Service Retention Schedule. The individual privacy notices will provide more information regarding the retention of different types of data. If you have a concern about the way we are collecting or using your personal data, we would prefer you contact to us initially so that we have the opportunity to see if we can put things right. However, if you are unhappy with the way that we have processed your information or how we have responded to your request to exercise any of your rights in relation to your data, you can raise your concerns direct with the Information Commissioner’s Office.